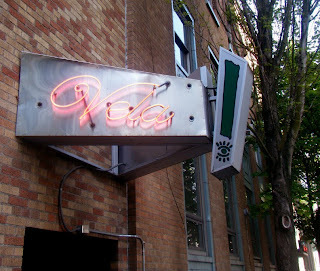 Vela is number 666 on my list of bars in the Seattle city limits. 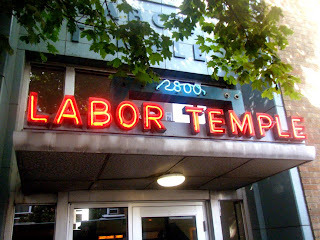 Perhaps I should take something exciting from that. I did see some references to the "Union Bar" which conjured images of a great old blue collar dive in the basement of this temple to an era where such working people used to command a bit more societal respect. But Vela Pizza, while in a great old Labor Temple space, is just a pedestrian pizza joint by day, and by night a bar that is a cliche second rate bump and grind club.